One of the most dangerous times of the year for pets in America is the summer months, particularly the latter days of the season when temperatures can really soar into the higher digits. As a pet owner, you need to pay attention to the weather forecast, particularly if you have dogs or cats that spend a great deal of their time outdoors. Pets are extremely vulnerable to things like sunburn, burned foot pads and heat stroke, which can lead to organ failure, blindness, convulsions, brain damage, seizures and could even become fatal. Whenever you suspect that your pet is sick or in danger, contact your local animal hospital in Dartmouth to describe the symptoms. Things like heat exhaustion and heat stroke can be extremely dangerous, and might require a trip to the emergency veterinary hospital. It is important to learn the different types of summer-related illnesses as part of your knowledge on seasonal pet tips. If you have any questions about any of these common problems and summer situations, speak directly with your Southeastern Massachusetts veterinarian. Heat Exhaustion – Characterized as the beginning stages of when you pet begins to overheat. You can often counteract the effects of heat exhaustion by immediately taking action to reduce your dog or cat’s body temperature in order to prevent it from developing into heat stroke. Some of the symptoms to look for include rapid panting or breathing, a reddening of the skin inside your pet’s ears, nausea, vomiting and diarrhea. The best way to lower body temperature is to get your pet into a cooler area of your home, such as near a fan, air conditioner or even in a basement. You can lightly dampen the skin with lukewarm water – not cold – and allow it to air dry to help the body cool down naturally. Heat Stroke – This condition occurs when your pet is unable to keep its body temperature in a range that is safe. A lot of people don’t know that dogs do not have the ability to sweat, which is why dampening the body with lukewarm water to mimic sweating is recommended for heat exhaustion. Panting can’t cool a dog down completely when they get overheated. The normal body temperature for a dog is between 100 and 102.5 degrees, depending on the size, age and breed. A dog that gets overheated beyond 106 degrees requires emergency veterinary hospital services at your local animal hospital in Dartmouth. Symptoms that heat exhaustion has moved into heat stroke include sticky saliva, gums that are pale or red, a tongue that is very bright red in color, and rapid panting. Severe symptoms can include weakness, depression, vomiting that can sometimes contain blood, shock, diarrhea and even coma. Bring your pet to your Southeastern Massachusetts veterinarian if you suspect severe heat exhaustion or heat stroke immediately. The best thing that you can do as a pet owner is to be pro-active and do everything you can to prevent summer-related issues from affecting your pet in the first place. Make sure that your pet has plenty of fresh water each and every day. Do not allow your pet to linger outdoors on hot surfaces, such as cement or asphalt. Walk your dog early in the morning or later in the evening to avoid getting burns on paw pads or consider going for a walk in a pet-friendly indoor mall or other shopping center instead where it is air-conditioned. Make sure that outdoor pets have access to shade and plenty of cool water to help them regulate their temperature. Keep indoor pets from spending too much time outdoors when they go out during the day, and consider bringing outdoor cats indoors when the weather gets too intense. Long-haired cats and dogs can also benefit from a summer haircut. Speak with your veterinarian at the local emergency veterinary hospital to ensure that it would be beneficial. Never ever shave your pet close to the skin, as pets need their fur to prevent sunburns from occurring. It is best to get a summer cut only if recommended by your Southeastern Massachusetts veterinarian and in the manner that would be best suited based upon the breed and level of activity. Consider getting a pet pool or inviting your dog to swim, if he is so inclined, to help keep body temperature down. Restrict outdoor exercise and never muzzle a dog in the summer, as it will prevent them from panting to cool down effectively. Never EVER leave your pet in a parked car. This includes outings where you will be parked in the shade or need to run into a store for just a few minutes. Studies show that the temperature inside of a parked car can soar over 140 degrees in just a few minutes. Being left inside of a parked car can be fatal for your pet. 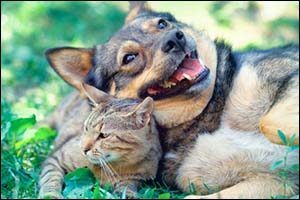 If you are new to pet ownership or would just like to learn more about keeping your pet safe during the summer in Southeastern Massachusetts, make sure to visit Anchor Animal Hospital in Dartmouth for a regular check-up or to learn more about how seasonal pet tips can keep your cat or dog safe year-round. Give us a call at 508-996-3731 to schedule an appointment or to speak with one of our highly trained and experienced veterinary team members.